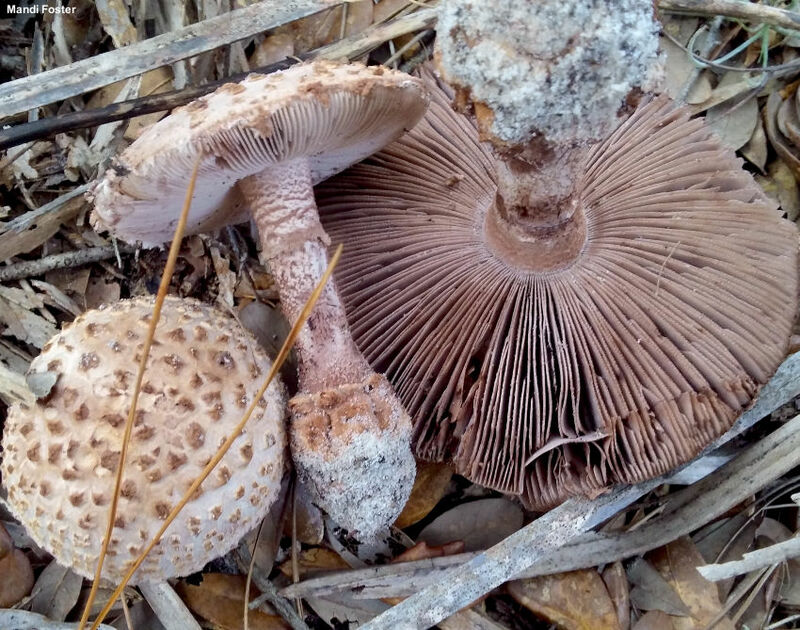 Rare and unusual, this funky Amanita looks almost like a brown version of Boletellus ananas, or a particularly warty version of Chlorophyllum rhacodes. It is known from only a handful of collections made along the Gulf Coast between Florida and Texas. In fact the collection illustrated and described here may be only the sixth record of the species! 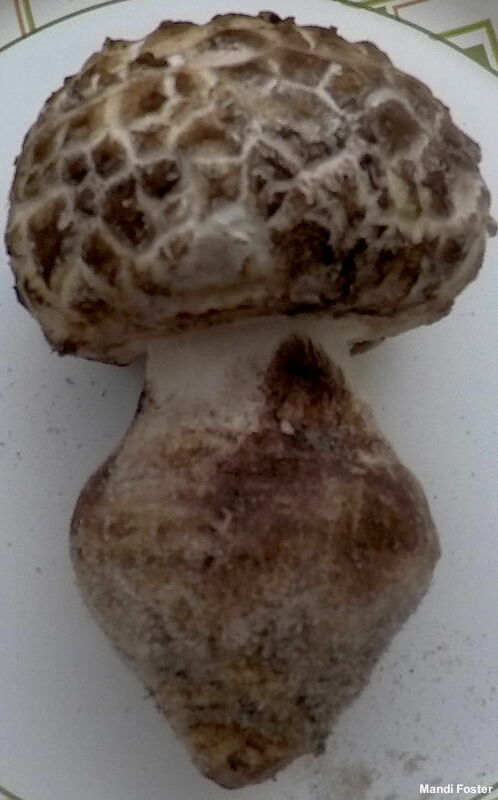 Amanita westii is a fairly large species with large brown warts, veil remnants hanging on the edge of the cap, a prominent bulb on the stem base, and flesh that bruise quickly reddish brown to brown. Under the microscope it features large amyloid spores and various elements that sometimes become strikingly brown to reddish brown in KOH or Melzer's. 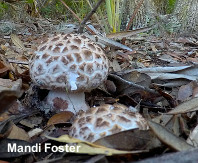 Murill (1945) first described Amanita westii from Florida, under oak. 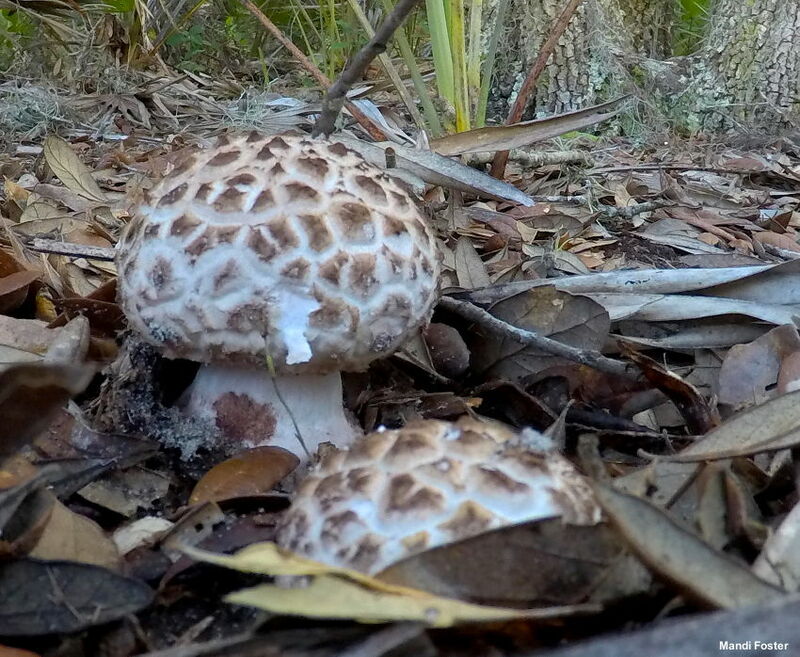 It has since been collected under oaks in Mississippi and Texas. 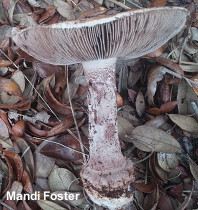 Thanks to Mandi Foster for collecting, documenting, and preserving the illustrated and described specimens; her collection is deposited in The Herbarium of Michael Kuo. 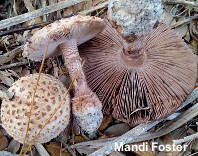 Ecology: Mycorrhizal with oaks, often in sandy soil; growing alone, scattered, or gregariously; June through October; rare; known from Florida, Mississippi, and Texas. The illustrated and described collection is from Florida. Cap: 9–15 cm; convex, becoming broadly convex in age; dry; fibrillose and whitish to brownish underneath large, pyramid-shaped, brown to dark brown warts; the margin adorned with whitish to brown veil remnants. 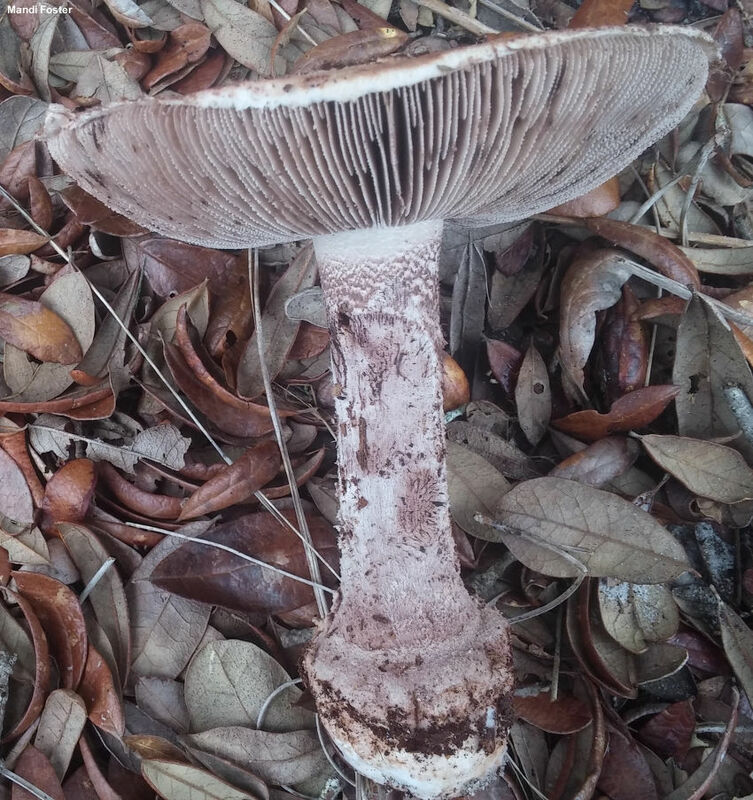 Gills: Free from the stem, or narrowly attached to it; close or crowded; short-gills frequent; whitish when very young, but soon brownish and eventually brown overall. 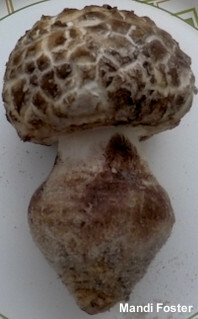 Stem: 6–14 cm long; 1.5–3 cm thick; fairly equal above a large, rooting basal bulb; dry; whitish when very young, but soon developing brown scales; bruising and discoloring reddish brown; with an ephemeral whitish ring that soon disappears; universal veil leaving warty brown ringlets around the stem base and the upper half of the bulb. 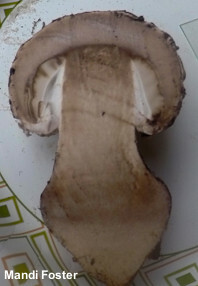 Flesh: Whitish; staining slowly reddish brown, then brown when sliced (up to 15 minutes). 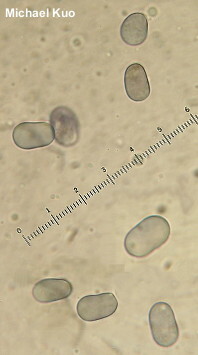 Microscopic Features: Spores 10–14 x 7–9 µm; ellipsoid but often a bit blocky, almost widely cylindric; smooth; hyaline in KOH; amyloid—but sometimes becoming reddish brown (nearly dextrinoid). 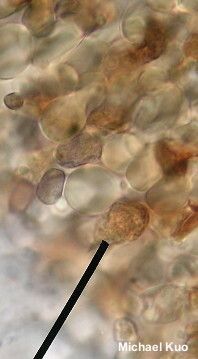 Basidia primarily 4-spored; occasionally 2-spored; hyaline or with brown to reddish brown contents in KOH and in Melzer's. Lamellar trama bilateral; subhymenium ramose. 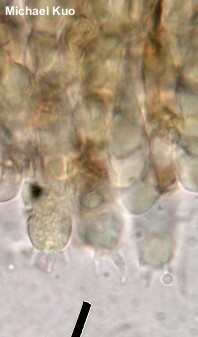 Pileipellis a poorly defined cutis of hyphae 2.5–7.5 µm; wide, brown in KOH. 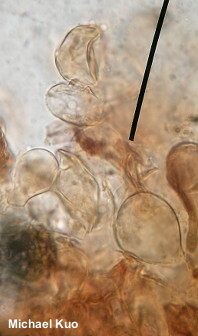 Velar sphaerocysts 20–50 µm across; subglobose to clavate or pyriform; smooth; thin-walled. REFERENCES: (Murrill, 1945) Murrill 1945. (Bas, 1969; Jenkins, 1979; Jenkins, 1986; Tulloss & Lewis, 1994; Tulloss & Lewis, 2017.) Herb. Kuo 10301701.